InfraRed (PIR) Motion Sensor with 8m dia. 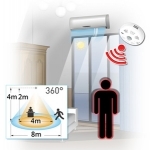 range (360° coverage), can switch a light on if required. Integrated Temperature Sensor. Modbus RTU or DCON Protocol. InfraRed (PIR) Motion Sensor with 8m dia. range (360° coverage), can switch a light on if required. Integrated Temperature & Humidity Sensor. Modbus RTU/TCP or DCON Protocol.